Sayid's alive, which Dogen is none too happy about. Sawyer leaves the Temple, and tells Kate not to go after him. So of course she leaves shortly thereafter to go after him. Dogen "tests" Sayid to see what he is, exactly. Whatever the test is supposed to do, Sayid fails it, indicating he's infected. Kate and Jin are out looking for Sawyer with a couple of the Others, but Kate takes them out so they can head off by themselves. Dogen has a conversation with Jack, and tells him that Sayid is infected, and must die, but Jack won't do it. Kate goes to the barracks, where she finds Sawyer grieving over the loss of Juliet. She leaves without him. Jin is heading off to find Sun, when the Others that were with him originally catch up to him. Jin gets his leg stuck in a bear trap, but the Others are killed by Crazy Claire. Locke heads to the barracks to talk to Sawyer, and gets him to agree to go with him to give him answers. Back at the beach, Ilana, Sun, Ben and Frank dig a grave and have a memorial for John Locke. Locke and Sawyer head into a cave on the side of a cliff along the water. 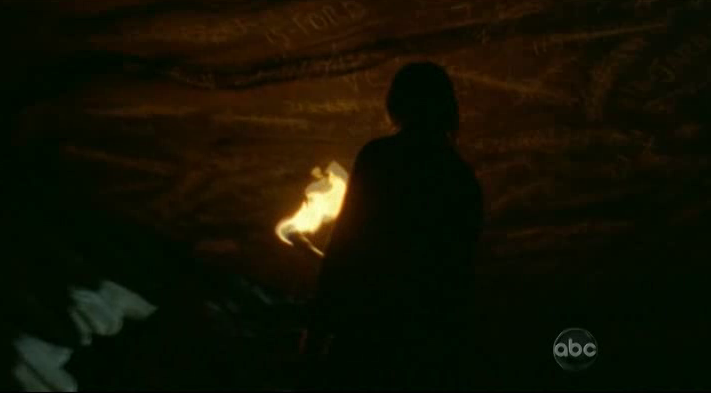 Down there, Sawyer sees the names of hundreds of people written on the cave walls. Most of the names are crossed out. But some of the names, Ford, Reyes, Jarrah, Shephard, Kwon, and Locke, are not. We discover that these people were all candidates to replace Jacob after he died, to protect the island after he's gone. Locke says it's all a lie, and offers Sawyer the opportunity to leave the island, once and for all. The episode runs 54:23 and is 455MB to download. You can stream the episode below (via Facebook), or go here to use torrents (better quality, recommended) to download the episodes to your computer.